MERCURY IS NOT THE WAY TO RECOVER GOLD!! the author shall not be liable for incidental or consequential damages in connection with or arising out of the furnishing or use of this material. I have no control over how you do these procedures. This procedure works for me and if something gets messed up it is your problem, not mine! The processes contained herein require the use of high heat, mercury and very dangerous acids, and must be performed in a well ventilated area. Always use mercury, sulfuric acid and nitric acid in a well ventilated area. DO NOT breathe the fumes. Mercury begins to vaporize at room temperature and its fumes can be deadly. Mercury and nitric acid can kill if swallowed. Any clean water without chlorine. Chlorine mixed with nitric acid can dissolve gold. Gold must be clean in order for mercury to attach itself. Sometimes placer gold will be covered with a thin film of oil, which will prevent the gold from being amalgamated unless the oil is cleaned off first. CAUTIONS: Working with nitric acid, can be very dangerous. Be extra careful to avoid spilling it on yourself or splashing it in your eyes. DO NOT breathe its fumes! When a solution of nitric acid is poured onto a dirty set of concentrates, the effect will be a bubbly reaction. Allow the concentrates to bathe until all such visible reaction has stopped. 1. Soak the concentrates in a 10:1 solution of nitric acid, which means 10 parts of water to 1 part of nitric acid. use a Pyrex beaker. This is to clean the gold. You can do a better job of this if you put the concentrates and the 10:1 solution in a rock tumbler with a plastic or rubber barrel (no metal, acid will corrode the metal). 2. Rinse the concentrates with fresh water so that the acid is diluted and washed away. Once this is done, the concentrates are properly set up for amalgamation. 3. Take a clean, large, copper gold pan and coat thoroughly with mercury, using a pad of folded cloth. Deposit the concentrates in the pan, add some fresh water and swirl and agitate until all visible gold has been taken in by the mercury. If you want to check for platinum, if you suspect it may be present, wash the black sands into a separate pan which can be checked later. 4. Using a rubber spatula, scrape the gold bearing mercury from the copper gold pan into a Pyrex beaker. 5. Wet a ball of virgin cotton and squeeze out the excess water. Place it into the bottom of an oral or veterinarian syringe and pour in the amalgam ball. 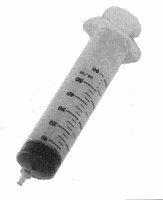 Replace the plunger and holding the end of the syringe over a container, press the plunger to extract the excess mercury. If the container is filled with water, the mercury will be prevented from splashing or bouncing out as it drops into the container if you hold the end of the needle under the surface of the water. 6. Remove the plunger from the syringe and extract the cotton containing the amalgam, using tweezers. Put the amalgam ball into a Pyrex beaker and set it in a safe place, downwind of any populated area within the vicinity. 7. Mix and pour in a solution of nitric acid and allow it to bubble until there is no visible reaction. BE CAREFUL NOT TO BREATHE THE FUMES GIVEN OFF BY THE CHEMICAL REACTION! 8. Pour off the acid solution into another glass jar or a beaker; so that, the mercury in solution can be recovered later (see how to do below). 9. If all of the mercury has not been dissolved from step 7, with the gold back in its natural flake and powder form, pour fresh water into the jar and use an old screwdriver to poke it around and break it up. Pour out the water and pour in another solution of nitric acid. Sometimes it is necessary to poke at the gold just a bit to break it up while it's being worked on by the acid. An old screwdriver works well for this. 10. When the reaction stops, flush with fresh water. If the gold is still not back in its natural form, repeat the above steps. When dealing with small amounts of amalgam, usually the gold will be thoroughly cleaned of it after step 7. Sometimes when working with larger amounts of amalgam, it is necessary to do the steps a few times as described above, or to use a stronger acid solution. NOTE: if you have a large amount of concentrates, you may wish to ignore steps 3 and 4 and place the concentrates and an estimation of the correct amount of mercury into a rock tumbler and allow it to turn for several hours. Some large scale operations employ the use of portable cement mixers. If a new cement mixer is used, run it first with a full load of sharp sand and gravel for 10 to 12 hours to scour out any paint that may be present, as it will contaminate the mercury. To recover the mercury in solution (see step 8), simply drop some aluminum foil into the acid solution. A chemical reaction takes place and the acid solution will drop the mercury to attack the aluminum. This causes the mercury to revert to its natural liquid metal form at the bottom of the jar. Then rinse out the acid solution and you will be left with most of your original mercury. After mercury has been used a number of times in the process of amalgamation, it becomes dirty and tends to break down into smaller, separate balls instead of it all coming together into a single mass. To clean dirty mercury, you simply soak it in a nitric acid solution of 30:1 part of acid. This will clean the impurities out and allow it to amalgamate properly again. Mercury can be used over and over to amalgamate and cleaned when necessary in this way. All plastic syringe is a must for filtering mercury. Used for cleaning dirty mercury or removing gold from amalgam. Uses standard cotton balls as filters. try a brass or plastic screen at the end of the plunger reciever to hold the cotton in place. in third world country's they just use a chamois and place the amalgum and beat it in a metal pan, twisting the chamois tight to press out the merc. the fumes are a real killer!! this method is not to be done!! it may cost you your life! !